Lion(TCC899x) is a Telechips’ next-generation Ultra High Definition OTT/ STB(Set Top Box) SoC (system-on-chip) delivering high performance and dramatic low power solution for IP, Satellite, Cable, Terrestrial STB, and extremely small sized form factor OTT box such as Smart Stick. The SoC supports full compliance with 4K contents security guideline and various ultra HW CAS for variable paid broadcasting STB system. Lion(TCC899x) is based on Cortex™-A53 Quad and Cortex™-M4 with a multi-format hardware video accelerator including 4K HEVC and VP9. The SoC integrates the latest high-end GPU to accelerate 3D/ 2D graphics processing and 4K resolution GUI. Telechips solution enables Lion(TCC899x) to run at stable open Operating Systems such as Linux™ (HTML5) and Android™. Alligator(TCC898x) is a SoC (System-on-Chip) with powerful multimedia solution, low power consumption and optimized performance. It is ideal for cost effective multimedia devices with low power STB (Set Top Box) such as Smart Stick, IP-Client STB with 4K 60fps decoding. Alligator(TCC898x) multimedia application processor is based on Cortex™-A53 Quad and Cortex™-M4 with a multi-format hardware video accelerator including HEVC and VP9 optimized to reduce power consumption, high-performance 2D/3D graphic engine for 4K resolution GUI and various peripherals to save total costs. Especially, Alligator(TCC898x) supports full compliance with 4K contents security guideline for variable STB application. In addition, Telechips solution enables Alligator(TCC898x) to run stable open Operating Systems such as Linux™ (HTML5) and Android™. The TCC897x is a SoC(System-on-Chip) with powerful multimedia solution, low power consumption and optimized performance. It is ideal for cost effective multimedia devices with low power STB (Set Top Box) such as Smart Stick, IP-Client, OTT, and IPTV STB. In addition, Telechips solution enables TCC897x to run stable open Operating Systems such as Linux™ and Android™. The TCC893x is a system-on-chip with powerful multimedia solution and high performance such as dual decoding. It is ideal for high-end multimedia devices such as Set Top Box, Media Box, and Tablet PC. TCC893x multimedia application processor is based on Cortex™-A9 Dual & M3 With a multi-format hardware video accelerator optimized to reduce power consumption, high-performance 2D/3D graphic engine for rich GUI, and various peripherals to save total cost. 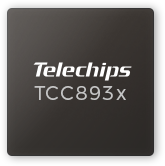 In addition, Telechips solution enables TCC893x to run stable open Operating System such as Android™ , Linux™ and Windows® Embedded Compact 7. The TCC892x is a system-on-chip that includes powerful multimedia solution and high performance. It is ideal for middle-end multimedia devices such as Tablet PC, Portable Multimedia Player, Multimedia Internet Device, and Home Entertainment. TCC892x multimedia application processor is based on Cortex™-A5 With a multi-format hardware video accelerator optimized to reduce power consumption, high-performance 2D/3D graphic engine for rich GUI, and various peripherals to save total cost. In addition, Telechips solution enables TCC892x to run stable open Operating System such as Android™ , Linux™ and Windows® Embedded Compact 7.